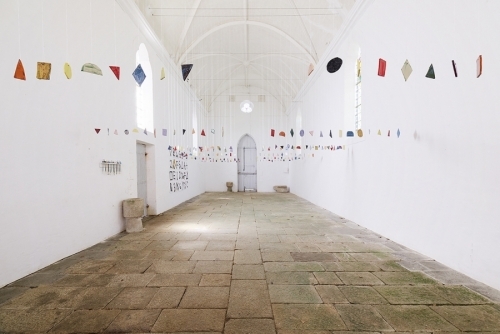 Polly Apfelbaum presents a site-specific installation for the 26th edition of L’Art Dans Les Chapelles, at Chapelle Saint-Jean in Le Sourn, France. Polly Apfelbaum exhibited since 1986 and each of its new projects reveals both a sense of continuity and an effect of surprise. Color is the central element of his work, both visually and structurally. His old pieces arranged on the floor were made up of hundreds of pieces of hand-dyed velvet, arranged in large configurations that seemed inspired by organic structures and resembled abstract paintings that would have slipped from the wall to form puddles Bright colors. In 2013, Polly Apfelbaum obtained a residency at the American Academy in Rome. The churches of the eternal city, where colors, light and materials are one, have been a great source of inspiration for her. She was also fascinated by suspended decorations and their impact on the perception of space. Since then she has developed the in-situ character of her work to create immersive and contemplative environments that are in line with her interest in the cultural aspects of color and phenomenological experience.